Another exciting MG Greek Mythology book!!! We are super excited to announce that another wonderful book about Greek Mythology has come out for younger kids like ourselves! We can't wait to get our hands on this!!! We want to say thank you to very nice people at I Am a Reader, Not a Writer and The Elliot Review for putting this together for everyone!! We have already started school here :( We aren't exactly jumping for joy for it either, well Mikey is but he is always jumping anyways. You guys can enter below and remember that if you are under 16 you need to make sure you have a parent/or guardian's permission. Hope ya'll enjoy your last days....of freedom too! 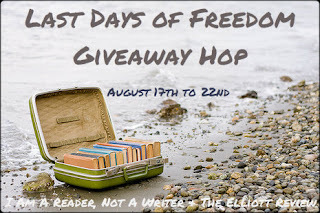 a Rafflecopter giveaway And don't forget to go to the other blogs on this hop and check out their awesome giveaways! 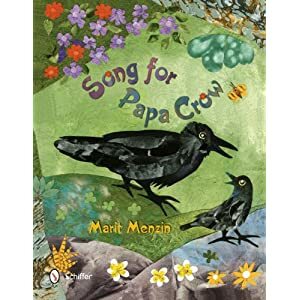 Little Crow loves to sing, and Papa Crow loves his song. But when Little Crow shares his crow songs with the other birds at the big old tree, they laugh and scatter. Maybe the Amazing Mockingbird can teach him to sing songs with the finches, flycatchers, and cardinals – and help him make some friends. But Little Crow should be careful what he wishes for… Using Mockingbird's tip, Little Crow quickly becomes the most popular bird on the block. But, in a moment of danger, he learns that singing someone else's song can have terrible consequences and that his own voice – and his father's love – is of the greatest value. Paired with colorful collage illustrations, this inspirational story is complemented by fun facts about North American birds and their sounds. . Grades Pre-K to 2. This was a beautifully illustrated story with a wonderful moral to be learned at the end as well. I love to read books to my children that are engaging, colorful, but most importantly, teaches them confidence and compassion. This book does that and much more. Song for Papa Crow has this collage- like feel to it which makes the birds really stand out for us. They seemed to come alive and pop off the pages for me and my sons. For young children, pictures are mainly what will keep them entertained. If the pictures are fun then the story will be more interesting to them too. Little Crow loves to sing but the other birds don't like his singing voice and they fly away whenever he starts belting out his "caws." This story book shows little ones that it is okay to be different and that is what makes you even more special. I am so happy that all my sons loved this story, even the older ones, and they were able to see the beauty in Little Crow, inside and out. Papa Crow is very supportive of his baby crow and is a good example for parents to see the differences in their "little crows" and celebrate them. Then in the back is this "Fun Facts" section that gives us details about all the birds mentioned in the book, including their specific calls. This is a great little book for that young bird watcher in the family with all the different birds, including a mockingbird. I have to give Song for Papa Crow five stars! J: I love all the pretty colors in the book. Baby crow is funny and really cute especially when he can't remember what a crow sounds like. My brother and I had fun pretending to be the different birds and singing like them. M: This book is really neat with all the different birds and learning about their different calls. I could read this book with my mommy because the words weren't very hard to say at all. I liked how Papa Crow told Baby Crow to just be himself because my mommy always tells me to be happy just the way I am. I liked learning about the mockingbird and I always wondered why it was named "mockingbird". Now I know why.